Pachinko Parlors are all over the place in Tokyo, especially in Akihabara. My impromptu guide from America said he hadn't really spent much time in any, so I had to find out what made Tokyo-ites so crazy about them. I found one close by and opened the door. A wall of sound and smoke smacked me in the face. After a few coughs and a second for my brain to adjust the volume on my ears, I plunged in. Inside were row upon row of things that looked very much like slot machines. And sitting in front of each were men of all of ages, most chain-smoking away. A flock of attendants wandered around, bringing drinks, cigarettes, whatever the men wanted. They also instantly appeared to stop me the minute I pulled out my camera. It was feeling more like Vegas every minute. I waded through the barrage of sound, futilely waving the smoke away, and walked up behind a guy banging away on one of the machines. Pachinko looks very much like "Plinko", that game we all know (well anyone over 30 years old, haha) from the Price is Right game-show. But instead of a formaldehyde-filled Bob Barker next to a 8-foot game board, Pachinko is a miniature version. You get something like 100 little steel balls. The balls enter from the top, bang around some little posts, then hit a spinning wheel which flips them down some chutes. Most of the balls fall into the bottom catch, but some pop into a hole and vanish. Graphic images flashed and sound effects blared so loud you couldn't talk as the man played. A stream of girls, dragons, and weird anime characters danced around in the background. The strategy wasn't very clear, but the after asking the attendant via hand-wave (basically I put both hands in the air and looked confused), he pointed to a hole that you supposed to get the balls in. I guess getting balls in the hole somehow gets you points. There are only two controls. One is a knob that releases the balls. Another is a big button that you smack when the machine screams at you "ATTACK!" with a big arrow that points to the button. In other words, you are supposed to smack the button like a trained monkey when given a signal. I contemplated training a bird to peck the button when the attack signal came on. 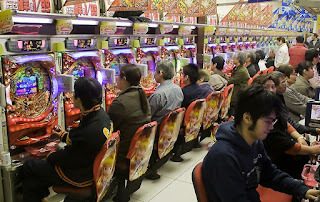 But I couldn't believe this many Japanese were so addicted to the game, there had to be more than fish-brain-level strategy involved. I knew this required detailed personal investigation. I plunked down a 1000-yen note (about US$12), time to see what this thing has got!! Of course, I felt it only appropriate to pick the one featuring school-girls in plaid skirts... hey, these are the most common! After turning the knob to release balls, they bounced down and some got flung into the hole. Eventually, enough hit the hole that 3 girls appeared and screamed "ATTACK" at me in Japanese. My Pavlovian mouth watered as I smacked the button. Kanji characters changed on a scoreboard, indicated that my score was different than what it used to be. But, to be honest, I had no idea if the scoreboard said I had a million points or negative a million. Perhaps the machine could sense my gaijin touch and was cracking jokes at me in Japanese. After awhile I gave up and handed my game over to my professional nerd handlers. They seemed to do a bit better. Apparently I hadn't noticed that you occasionally had to take the balls in the bottom and move them from one shelf to another. This greatly increases the amount of time you get to turn the knob and smack the button. I wondered if the game said anything about Japanese culture. The only thing I could come with up is, perhaps something that seems simple on the surface has a level of complexity underneath that the average gaijin completely misses. Or, maybe it really was just another way for men to stare at school girls, smoke, and drink. Oddly, the whole experience made me longing for a round of golf.